If you are familiar with the Slicing Pie model, the Pie Slicer should be fairly self-explanatory. The rules and logic built into the Pie Slicer application are exactly as outlined in the Slicing Pie books and videos. If you are not familiar with the Slicing Pie model, you may find the software and calculations a little confusing at first and you may not understand terms like "the Well" and "Slices". Click here for more information about learning the model. Like most online applications, the Pie Slicer is designed to be intuitive and self-explanatory. Help text is built into the program and we will continue to upgrade and enhance the program based on user feedback. It is an easy program to use. The Home tab in the Pie Slicer is the main display page. It tells you just about everything you need to know about your Pie. On the left are the members of your team, default images are “Grunts,” which are fictional animals I created to represent a hard-working startup employee. On the right is a pie chart showing the current split, click the tabs to toggle to bar chart showing Well balances for each participant. Above each chart you will see tabs that reveal the number of slices in the Pie and the total amount of money in the Well. There are four primary user roles in the application: Owner/Administrator, Employee, Executive and Advisor. The Pie owner creates the Pie on their account and pays the monthly or annual fee. 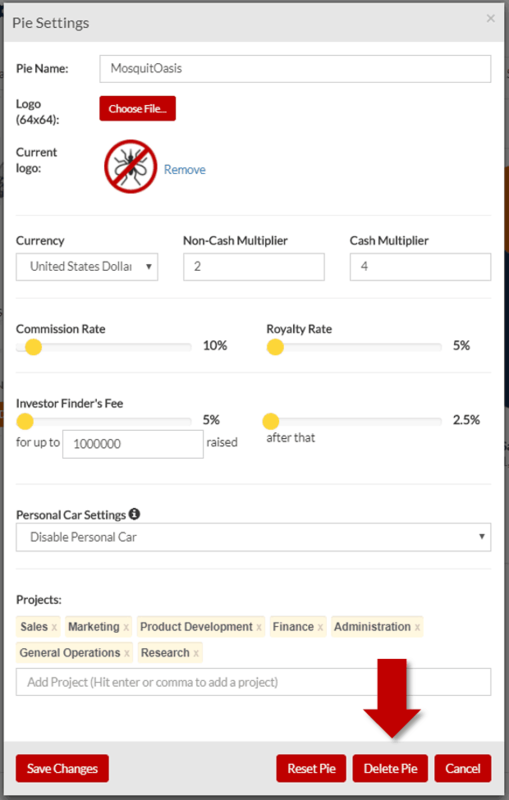 Only owners have “all access” to the tool with the ability to view and edit all the settings, including salaries and Pie settings. Members of the team can log their own contributions through their own account. However, even if they don’t set up their account, you can add contributions for them. Only Pie owners can log contributions from all members in addition to their own, and only they can make deposits and withdrawals from the Well. This ensures there is one point of contact for the Pie. Pie owners can add new members to the team. When a new member is added, they will receive an email inviting them to join the Pie and input their own contributions. When users are added you can designate them as Executives, Employees or Advisors. Individuals have control over how their names and avatars appear on the site so you will not be able to edit their name and avatar after you add them. To add a team member, click the “Add Team Member” button in the upper left side of the screen. Executives have the same view into the Pie as the Pie owner, but they will not be able to change the settings for anything except a few personal settings. Only Pie owners have the ability to change all the settings. Employees and Advisors cannot view any information related to the Pie, except for their personal contributions. The main difference between an Employee and an Advisor is that the Advisor can’t be fired as described earlier. Below are screenshots of the same Pie as viewed from the point of view of different account types. 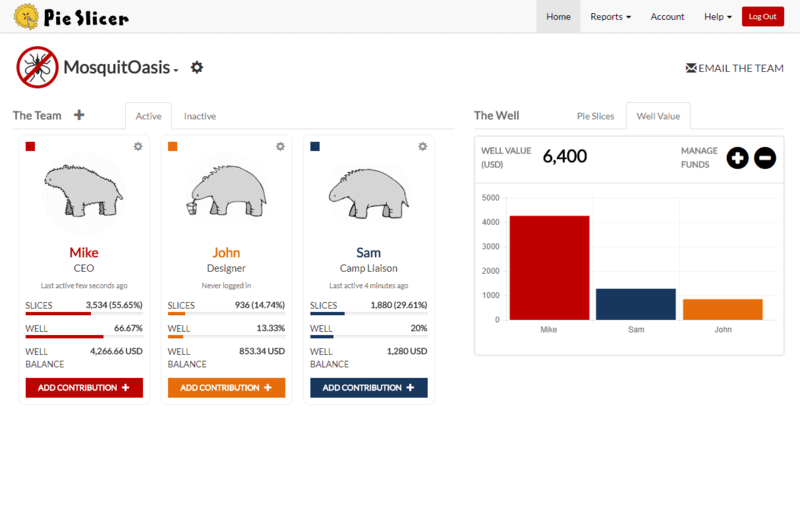 Notice that in the Advisor and Employee view the other team members do not appear and that the buttons are grayed-out for adding team members and managing the Well. This person’s access is limited to their own activities. * Executives will only have a contributions button on their own tile. The Slicing Pie model requires people to track their contributions of expenses, equipment, ideas, supplies, facilities, sales and, most importantly, time. The Pie Slicer includes tracking for all contributions so it can properly allocate slices based on an individual’s contributions. This can be done as often as you and your team sees fit. Individuals can sign in and log their contributions at their convenience, or the Pie owner can do it for them. The Pie Slicer keeps track of all the contributions and when people last logged in so the Pie owner can provide a gentle reminder when necessary. Many people cringe when asked to keep track of their time. They usually don’t mind tracking their expenses, but they don’t like tracking their time. You and your team can decide the level of granularity you will track using the Pie Slicer and the detail of the notes captured, but I don’t recommend trying to avoid this task altogether. Understanding how you and your team spend your time is as important as keeping track of your expenses (maybe even more important). The time-tracking tools in the Pie Slicer are basic and will allow your team to input their time, allocate the time to a specific project or category, and provide a description of what they did during that chunk of time. We tried to make it as painless as possible. We don’t like tracking our time either! If you make a mistake entering contributions it can be edited or deleted by the Pie Owner/Admin. Edit and delete icons will appear to the left of the contribution on the contribution report or Lump-Sum report. Well contributions can be undone one-by-one starting with the most recent contribution by clicking "Undo Last Transaction". Only the Pie Owner/Admin can edit or delete contributions. 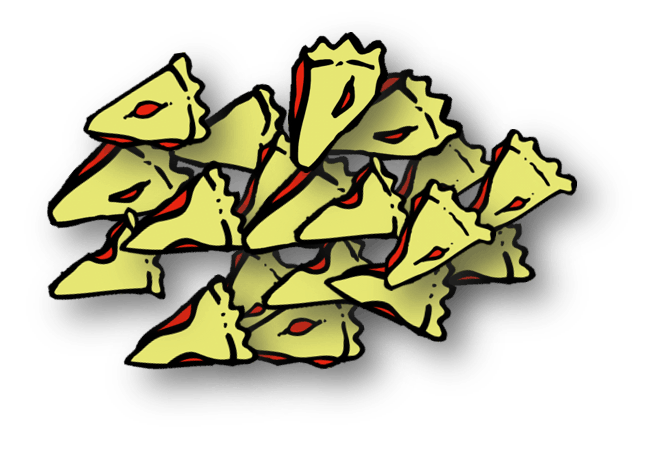 A user can participate in multiple Pies at one time. They can be invited to participate as an individual contributor or they can start their own Pie. The active Pie’s name will appear in the upper left side of the screen. Click the name to change Pies or start a new one. Pie owners have control over the Pie settings, can add users, and are responsible for the payment. Thank you, by the way, for your payment! Individuals have control over their own information such as name and image, but only Pie owners can set the salary. Salaries are set per Pie depending on what your role is. If you are the VP of marketing for one Pie and the burger-flipper for another, your VP role will probably have a higher fair market salary. Home Brings the user to the main page with the Pie chart. Account Access to the variables that can be changed by the individual account owner. Help Tips and information about the tool. Access to Customer Service. As mentioned above, individual users will only be able to view their own information, whereas Pie owners and Executives will be able to see information for all participants. The Pie Slicer has a variety of settings that impact how slices are calculated. Most of the settings are pretty self-explanatory, but I will cover a few critical settings here. 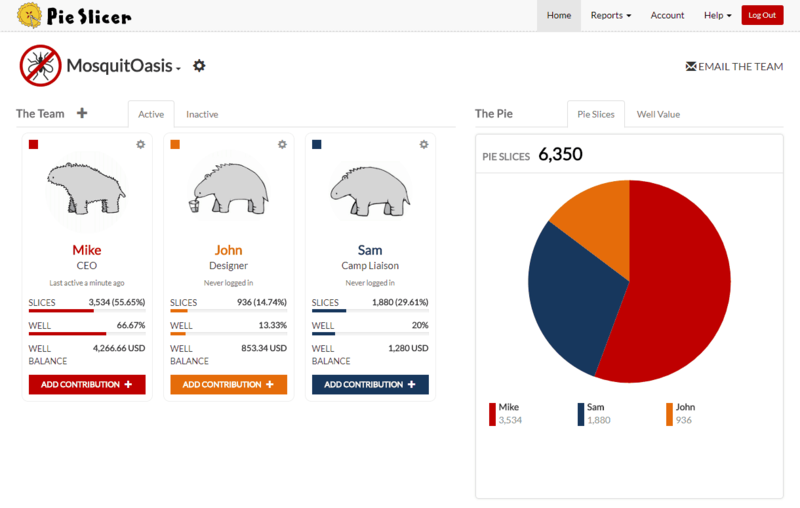 Once the individual contributor is added to the Pie, they can log contributions. The Pie owner can also log contributions on their behalf. After a team member is added, the Pie Owner can still edit their settings by clicking on the little gear icon found above and to the right of the team member's avatar. 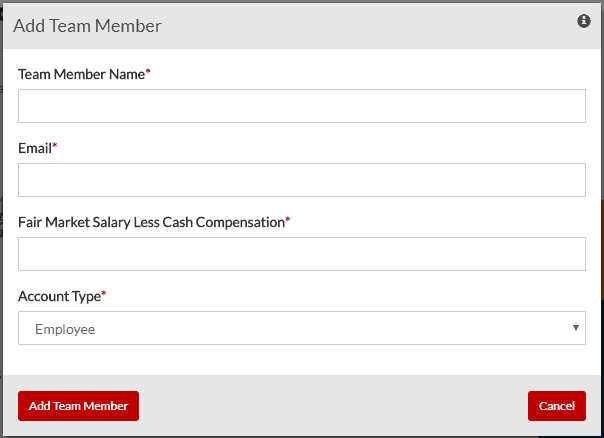 Salary is required when adding the team member for the first time. When entering salary, input the fair market salary less whatever cash compensation is being paid from the company account. 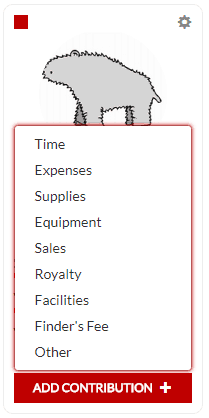 If you start paying more, you should edit this field. The Pie Slicer will automatically convert the salary to an hourly rate by dividing by 2,000, which is roughly the number of working hours in a year for a full-time job. In the U.S. a full-time job is 40 hours per week and most Americans take two weeks off for vacation. Most countries have a similar number, although vacation time varies. As long as all the participants are using the same calculation for hourly rate, there is no need to adjust this number. If the Pie owner edits a team member’s salary, the change will only affect future calculations; it will not go back in time and change past contributions. This is true for all changes made to settings. Account types, as described above, determine how a user views and interacts with the program. The first user account in a Pie is the Pie Owner/Admin who has all-access to view and edit information. Only the Pie Owner can edit past contributions. This means that if a Grunt makes an entry mistake, he or she will have to contact the Pie Owner to edit or delete the entry. Executives can see all the information for the Pie, but can only add contributions for themselves. ​Additional restrictions can be added to a user account. The Pie Owner can set a read-only restriction so he or she will have to add contributions for the user. For instance, a landlord could be set up as a view-only user and the Pie Owner could set up a reoccurring rent contribution. ​Pie Owners can require that a user's contributions are approved before being added to the Pie. For instance, an owner might want to closely monitor the activities of a consultant. Be sure to click "Save Changes" before closing the settings box! Pie Owners can Remove/Terminate a user from the User Settings screen. Doing so will apply the recovery rules to the users account. 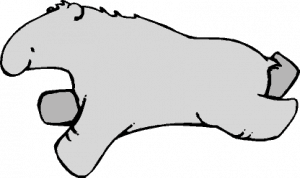 Terminated users will move to Inactive status until they are bought out, if necessary. To access Pie Settings, click the Pie Setting gear icon next to the name of the Pie. The Pie settings screen is where you set the parameters used in the calculations for your Pie. Below is a description of the impact the settings will make on your Pie. Changes to any of the settings will only affect future contributions; they will not affect past contributions. The default settings for the multipliers reflect the recommended values. Other settings will depend on your company's policies. Currency Use the primary currency that your company operates under. When calculating a buyout, a slice will be converted into that currency on a 1:1 basis. The Pie Slicer will not consider exchange rates. Please note that buyout price is not the same thing as value. It is simply the fair price to pay someone to get their slices back when they leave. Non-Cash Multiplier This is the multiplier for non-cash contributions including pre-owned equipment and supplies. The default setting is 2. I don’t recommend changing this for reasons described earlier. Royalty Rate This is the rate (%) used to calculate royalty payable to the owners of intellectual property behind the ideas that generate revenue. Set the rate based on fair market rates for your industry. This can vary dramatically, so you’ll need to do a little research to get the right number. The default is 5%. Commission Rate This is the rate (%) used to calculate commissions payable to the salespeople. It is calculated as a percentage of revenue generated. Your rate will be based on competitive sales compensation programs in your industry, your company's policy and sales plan. The default is 10%. Finder’s Fee If your company wants to award a finder’s fee to people who bring in investments (not common), you can set two rates. One for the first X amount of cash, and one for the rest of the cash. Personal Car Your company can decide how it wants to calculate slices when people use their own cars for work. Projects Projects are used to see how time and resources are being spent. You can add or subtract projects. Reset Pie Resetting the Pie will erase all transactions so you can start over. Delete Pie Deleting the Pie will cancel your subscription to the Pie Slicer. Be sure to click "Save Changes" before exiting the Pie Settings screen. 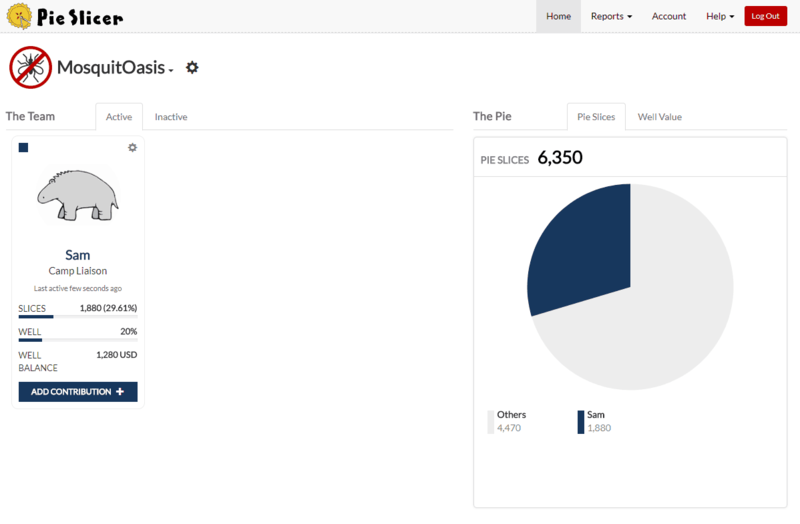 The Pie Slicer will convert contributions to slices using the Slicing Pie calculations. There's nothing magic about these calculations. The model simply tracks any owed, but unpaid compensation or reimbursement and applies the appropriate Multiplier. The Well is method for accounting for cash investments that have been given to the company, but not spent. Only at-risk contributions create slices in the Pie and money sitting in a bank account is not at risk. So, when money is added to the Well no slices are created. However, when money is withdrawn from the Well slices are created and allocated to individuals in proportion to their cash balance in the Well. In practice, the Well is a corporate savings account into which deposits are made. Withdrawing money from the Well is akin to transferring money from corporate savings to corporate checking to pay bills. To ​deposit funds into the Well click the "plus" icon, to withdraw funds click the "minus" icon. In Slicing Pie version 2.3 and earlier, the calculations convert the value of contributions to what I referred to as “Theoretical Value” or “Relative Value.” In the Pie Slicer the value is expressed as “slices”, instead of a currency to underscore the difference between what’s at risk and the actual value of the input. Using a currency, such as dollars, made it seem like the amount somehow reflected an actual value. It’s important to note that a company’s value is not equal to the sum of inputs. Early-stage startups are exceedingly difficult to value and efforts to do so are generally futile. When the term “slices” is used, instead of currency, people seem to have an easier time understanding that the number of slices is unrelated to the value of the firm. Theoretical Value and Slices are the same, and the results of calculations that use them are the same no matter what you call them. If you no longer want your Pie, you can delete it and cancel your subscription. This will erase your pie and stop charges for the Pie. This action is not reversible! To delete your Pie, click “Delete Pie” from the Pie Settings menu, the button is at the bottom. If you have multiple Pies you will need to delete each Pie individually. Setting up an account on the Pie Slicer is like setting up an account on just about any other kind of software site. You enter your name, contact details and payment information. The Pie name is whatever you want to name your Pie. Most people name it after their company name. Enter the value as an annual amount without punctuation: "50000" instead of "$50,000.00" for instance. If you are familiar with the Slicing Pie model you know that it bases the split on all types of contributions including time. This field allows the software to keep track of your contribution of time, specifically the portion that is unpaid. Any unpaid salary is “at-risk” and is taken into consideration in the calculations. Enter only the unpaid portion of your salary in this field. The Pie Slicer will use it to calculate your hourly rate based on the rules of Slicing Pie.